At an estimated 570 light years away, the Beehive (sometimes called the Praesepe) is one of the closest open clusters to us. Astronomers estimate its age to be 600 million years. Back in the day, Galileo reported seeing about 40 stars but with today’s telescopes, the number seen is now in the hundreds. With Cancer situated on the ecliptic, the Moon and planets from time to time come close to the cluster. Such a digital moment comes a few months from now during the evening of June 16 when the 15 percent crescent Moon and Venus will be close to the cluster, creating a stunning view. Stars are ranked from bright to faint values or magnitudes by following the Greek alphabet in descending order such as Alpha, Beta, Gamma, Delta etc. Such is not the case with magnitude 4.3 Acubens – deemed the alpha star. In fact is does not even rank second. Somehow Acubens stands behind magnitudes 3.8 Beta, 4.2 Iota and 4.2 Delta. But this spectral class A star has strange absorption readings indicating a "metallic line". Acubens is also a double star system with its companion is mere 0.1 arc second from the primary star – comparable to the distance of the Sun and Jupiter. 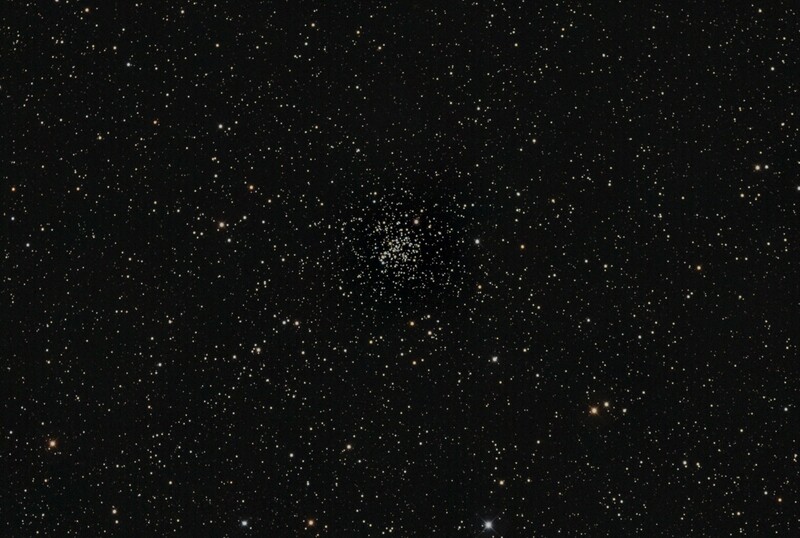 Located two degrees to the west of Acubens is the open cluster M67. As large as the full moon and hovering around naked limitation, this magnitude 6.1 swarm of about 500 stars is estimated to be around four billions years old. It is believed that about one hundred stars are like our Sun in its physical properties as well as a couple of hundred white dwarfs. The Beehive and M67 are the only two open clusters residing within the borders of Cancer. But there are a few great looking galaxies to locate, such as NGC 2775 situated to the lower left section of the constellation. Located some 60 million light years from us, NGC 2775 has delicate arm structure that shows a few areas of star formation. This galaxy has produced only one Type 1a supernova back in 1993. This type of supernova is triggered by a white dwarf stealing material from a dying giant star of its binary system. If the white dwarf grows larger than 1.44 solar masses pressure and heat will reignite the dwarf causing the supernova. Planets Venus and fainter Mercury are climbing in the western skies. Mercury is located to the lower right and quickly surpasses Venus on the 3rd of the month. The planet Uranus will be located to the upper right of Venus on the evening of the 29th. This also the best time of year to find and image the faint zodiacal light in the west. For a two week period from March 5 look for the faint, slanted pillar of light that does not quite reach the Pleiades Cluster, so include the horizon on the right and M45 on the left in your one to two minute image with a wide angle camera lens. Dark moonless nights are a must to see the reflection of interstellar dust in our solar system. The zodiacal light is seen in the west in March and in the east in September. The other naked eye planets are seen in early morning skies starting with brilliant Jupiter. The “King” of the planets is seen low in the south east by midnight local time. A telescope is required to follow the night shift of its four Galilean moons. Refer to page 232 of the RASC Observer’s Handbook 2018 for shadow and transit times. The red planet Mars will then rise about three hours after Jupiter and the ringed planet Saturn a couple hours after that. By 5 a.m. all three planets are nicely placed in the sky with the constellations Scorpius and Sagittarius. In January we had two full moons with the second referred as the Blue Moon. This will also occur in March as the Snow Blinding Moon occurs March 1 with the Maple Syrup Moon (Blue Moon) on the 31st. The absence of the full moon in February was known as the Metonic cycle which occurs in 19 year intervals. Last time this occurred was in 1999 with the next in February 2037 along with January and March being Blue Moon months. The clocks change in most locations on Sunday March 11 at 2 a.m. local time to welcome Daylight Saving Time by springing ahead one hour. Spring Equinox officially begins on March 20 at 12:16 p.m. eastern.